Couldn't think what to post for 'shoe of the week' as I hadn't come across any exciting finds whilst browsing the internet this week... But then I remembered I actually purchased some great heels this week! They are £15 from Marks and Spencer, which I was really impressed at as M&S are known for the quality and longevity of their items. Check them out here! 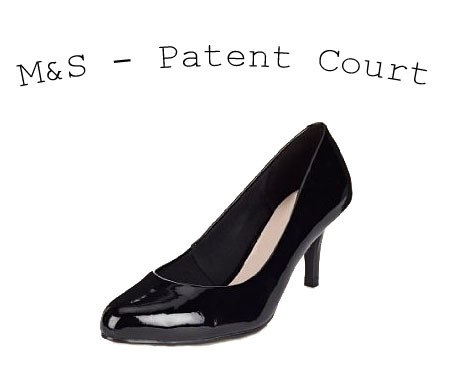 I pictured these paired with cropped cigarette trousers but will also be great for work, basically a classic patent style that you need in your shoe collection. The heel is tiny - only 70mm and they come in wide fit and half sizes. So they fit perfectly and will not slide off, brilliant shoes! I saw these in store, apparently theyre getting more in loads of different designs and colours. Erm hello leopard print ones! Great price too aren't they fab!